Leonard's 27th novel, and his old mastery glows as he offers yet another variation of his popular formula that pits quirky psychos against offbeat heroes. Wayne and Carmen Colson (he's a skyscraping ironworker; she's a real-estate agent) are a fetching near-middle-aged Algonac, Mich., twosome who have the bad luck to run up against Armand "the Blackbird" Degas and Richie Nix--classic Leonard bad guys. Armand, part Ojibway, is a contract hit man, cold and calculating, while Richie's a hotblooded punk who kills on a whim. Together, they aim to extort Carmen's rich boss out of $10,000; but when they go to collect, they find Wayne instead--at the real-estate of rice to apply for a white-collar job at Carmen's request. Not one to be bullied, Wayne slaps down Armand and tosses Richie out a second-floor window. Obeying Armand's dictum of "killshot"--never leave unslain prey--the bad guys, now holed up with Richie's Elvis-obsessed girlfriend, vow vengeance, shadowing the Colsons' house as Wayne works the high steel and shares his fears and anger with brainy, loving Carmen. Tension mounts until Richie shotguns the Colsons' picture window, driving the couple reluctantly into the Witness Protection Program in a small Missourian town--where they mn up against a loutish federal officer who comes panting after Carmen when Wayne's new job as a riverboat worker takes him away for a night. Frightened, Carmen races back to Algonac--and smack into a nerve-jangling final stalk-and-shoot with Armand and Richie. Showcasing all of Leonard's strengths--the dead-on dialogue, canny pacing, mesmerizing villainies, ironic social commentary--and, at the novel's heart, something more: a couple who, in the tough wisdom of their marriage, add a new warmth and depth to the author's work. 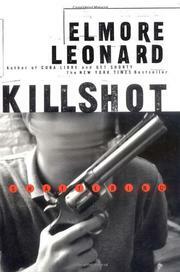 One of Leonard's best, then, and certainly his finest since Glitz.